A recent news that amused many Biafrans was that which hit the newsstands on June 29, 2018. 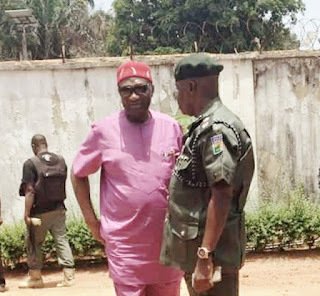 It was a news story indicating that the Nigerian police had apprehended two men it claimed to be members of the freedom fighting Indigenous People of Biafra (IPOB), who detonated a bomb in the village home of John Nnia Nwodo, the President-General of the umbrella Igbo organization, Ohanaeze Ndigbo. Nnia Nwodo as the leader of Ohaneze, a self-acclaimed elders group of the Igbo intends to rope in IPOB in the crime. According to the report, the men were responsible for bombing Nwodo’s home at Ukehe on April 29. By this singular action, Nwodo contracting the police to tell this lie has shown what little mind he and his fellow Ohaneze elements possess. Who, in his right senses, would believe that IPOB has anything to do with the detonation of such inconsequential bombs. Who does not know that it is Ohaneze elements that play childish games with bombs whenever they are in disagreement? It is appalling to observe that in spite of all the claims of Ohaneze elements to intellectualism, this is the best they could come up with. What Nwodo and his group has just done is taking its bombing stunts to outlandish and ridiculous level. How can IPOB, a worldwide group of highly educated, sophisticated and connected individuals that has their presence in more than 88 countries of the world (more than Nigeria) would be throwing childish IEDs? The world knows that IPOB is the biggest non-violent freedom fighting group in the world. The world knows that IPOB is so sophisticated that if it wants to turn violent, it would not be by throwing common IEDs around. Who does not know that Ohaneze has a record of settling scores amongst themselves by throwing bombs against themselves? Ohaneze elements have always done this each time they shortchange one another during the sharing of monies they squeeze out of politicians through their nefarious activities. A good example was the explosion in January 2015, when another IED was detonated at the dirty, ram-shackled, and unkempt building at 7 Park Avenue G. R. A. Enugu, which they called their national headquarters. The explosion came few hours after the chairman of their Caretaker Committee, Ralph Obioha, constituted a panel to probe the former chairman of the group, Chief Enwo Igariwey and his executives. The explosion led to a fire which affected parts of the main hall of the building. This being the case, Nwodo should be told to respect his old age and stop childish lies and stunts. In our land, it is an abomination for old men to tell lies. If he has shortchanged any of his members in the sharing of booties from their Operation Python Dance activities of last year, he should go and settle scores with them and leave IPOB out of it. IPOB is peaceful, IPOB does not throw bombs. IPOB has achieved so much with its peaceful disposition over the years that Nigeria is already falling apart on its hinges. Why should IPOB destroy her good reputation earned in the world by condescending so low to begin throwing bombs now? Nwodo should grow up.